NEW ORLEANS -- A New York real estate heir pleaded guilty in New Orleans on Wednesday to a weapons charge and agreed to an 85-month prison sentence, a move that could usher in his extradition to California to face murder charges. 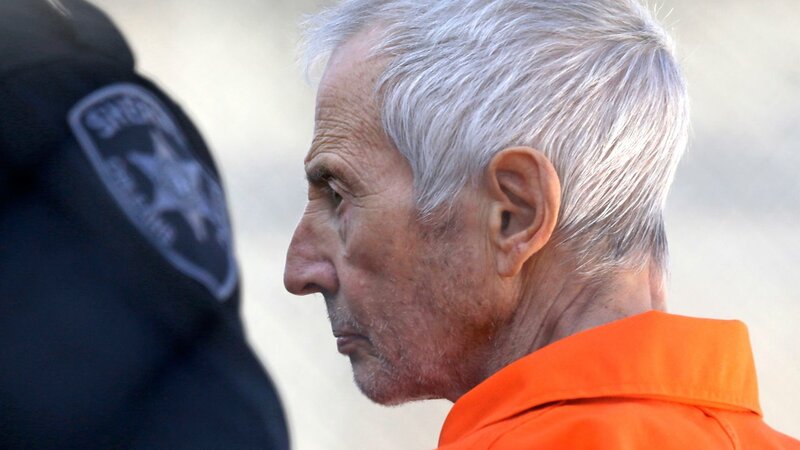 U.S. District Judge Kurt Engelhardt told Robert Durst that he will not make the plea final before he reviews a pre-sentencing report due in two weeks. Durst, 72, appeared frail. He said mostly "Yes, your honor" and occasionally "I'm sorry; I couldn't hear that." Defense attorney Richard DeGuerin occasionally repeated questions into Durst's right ear; he told the judge that Durst's left ear is completely deaf. Durst wore an orange jail jumpsuit, and his hands were shackled to his waist. When Durst was sworn in, the judge told him to raise his right hand, quickly amending that to "as best you can." Durst admitted that he illegally carried a .38-caliber revolver after being convicted of a felony. The charge stems from his arrest in a New Orleans hotel last year by FBI agents who feared he was about to flee to Cuba. The gun was found in the hotel room he had taken under the name Everette Ward. After his arrest, a package with $117,000 in cash arrived, addressed to Everette Ward. Durst will forfeit that money, Assistant U.S. Attorney Michael McMahon said after the hearing. Durst was charged last year with the 2000 death of his friend Susan Berman after mumbling "killed them all" during the taping of an HBO documentary. His lawyer, Richard DeGuerin, says Durst did not kill Berman. McMahon called the plea agreement a "good result." The maximum would have been 10 years and a $250,000 fine. "Now he goes on to Los Angeles to face a charge of murder" in Berman's death, the prosecutor said. He describing the proposed sentence as "the result of very intense negotiations" among federal prosecutors, Durst's attorneys, and the Orleans Parish District Attorney's Office, which originally brought a weapons charge against Durst. If Engelhardt accepts the plea, prosecutors in Los Angeles have agreed to arraign Durst by Aug. 18, McMahon told the judge. "This agreement has a lot of moving parts and a lot of jurisdictions. What we're doing and have been trying to do from the start is get Bob Durst to Los Angeles," defense attorney DeGuerin said after the hearing. "Bob Durst did not kill Susan Berman, does not know who did, and wants to prove it." Although Durst waived extradition from the start, he will remain in Louisiana at least until after his sentencing. If the judge accepts the sentence, then the Bureau of Prisons decides where Durst will serve it, though Engelhardt can recommend a prison. DeGuerin told the judge he will ask for the Terminal Island prison because it's close to Los Angeles. The plea bargain will be nullified if the judge gives Durst a different sentence, McMahon said. An estranged member of the wealthy New York real estate family that runs 1 World Trade Center, Durst is accused of killing Berman to keep her from talking to New York prosecutors about the disappearance of Durst's first wife, Kathleen, in 1982. FBI agents tracked him to a New Orleans hotel on the eve of the finale of "The Jinx," HBO's six-part documentary about Durst, his wife's disappearance, Berman's death and the death and dismemberment of Durst's neighbor Morris Black in 2001. Durst was formally arrested early on the day of the broadcast, before viewers saw him in a washroom, still wearing a live microphone and muttering, "There it is. You're caught! What the hell did I do? Killed them all, of course." The previous felony that is part of Durst's plea was a 2004 plea in Pennsylvania to possessing a weapon both while under indictment for Black's death and doing so while a fugitive on the murder charge. He ultimately testified that he killed Black in self-defense, and was acquitted of murder.